Ad Blockerr seems to be a really trustworthy program because it promises to block malware, pop-ups, and protect you from URL redirects. In most cases, users download the trial version of the program from its official website adblockerr.com; however, specialists say that this program might also travel bundled with other programs and thus slither onto your computer without permission. Even though Ad Blockerr really blocks pop-up ads, you should not keep it because it is not a trustworthy program. All the mistakes on the main page of its website confirm this presumption. Our specialists suggest that you deal with untrustworthy programs as quickly as possible. In other words, it is very important that you delete Ad Blockerr from the system. Even though Ad Blockerr is going to act as it promises, you will be able to use it for 15 days only. In order to continue doing that, you will have to buy its full version which costs $19.99. This free version is rather annoying too because it might display commercial advertisements on your screen. As ads might redirect to corrupted websites, we do not recommend clicking on any of them. Unfortunately, we believe that Ad Blockerr is going to perform other activities too. Specialists say that this adware program is going to record details regarding your browsing activities. On top of that, there is a slight possibility that it can connect to the Internet without permission. Actually, other more trustworthy programs that help to block advertisements exist; thus, we suggest that you delete Ad Blockerr and install one of them. 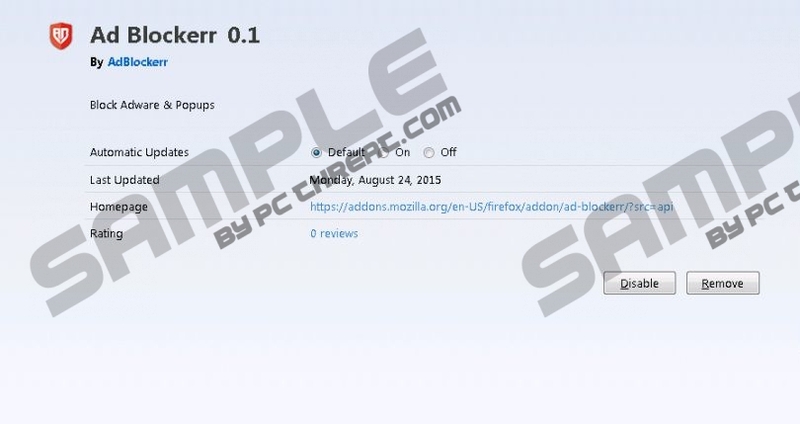 Specialists working at pcthreat.com have carried out a research and found out that Ad Blockerr is distributed via malicious installers and it usually comes bundled with other untrustworthy programs. Therefore, we highly recommend that you check your system’s condition. You can easily do that by scanning your computer with an antimalware scanner. Untrustworthy tools cannot help you to detect malware, so we suggest that you acquire SpyHunter, which is 100% reliable, or a similar tool. You will simply have to open your security tool and scan the system with it. It is possible to detect threats manually, but this is definitely not an easy process, so we do not recommend doing that yourself. You have to remove Ad Blockerr from the system even if it promises to act in a very beneficial way. In order to do that, you will have to erase its extension from your browser. If you have never done that, you should use our manual removal instructions (see below). Another way to fully get rid of Ad Blockerr is to scan the system with an automatic tool, such as SpyHunter. We do not say that you cannot use another tool for this matter, but we highly recommend that you double-check whether your tool is 100% trustworthy. If you want to try the free SpyHunter scanner, you should scroll down and click on the Download button. Click on the extension associated with Ad Blockerr. Quick & tested solution for Ad Blockerr removal.